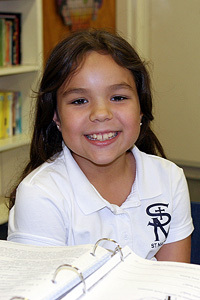 St. Martin’s elementary program includes one class per grade with enrollment limited to no more than 20 students per grade. Each class is self-contained with a classroom teacher providing instruction in language arts (reading, phonics, writing including penmanship), mathematics, social studies, and science. 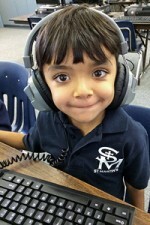 St. Martin’s believes that it is important that students learn to read beginning with letter recognition, phonics, and sight words in Kindergarten and progress to reading to learn throughout elementary school. Phonics and literature is emphasized in all grade levels. Student will also learn to write in a variety of genres helping students to learn to communicate their ideas effectively. St. Martin’s mathematics curriculum helps students to understand mathematical concepts and to obtain a mastery of math facts. Students begin with number sense in Kindergarten and progress through to fractions, decimals and more by 5th grade. Through St. Martin’s science curriculum, our students investigate and learn about the world around them. Our curriculum includes research on famous scientists and science concepts, experiments, and may include field trips to enhance the science curriculum. St. Martin’s social studies curriculum helps students to identify with communities, near and far, past and present. We believe that helping students to understand our past and how they relate to others, helps our students to identify and empathize with others. Students also work with enrichment teachers each week in art, library, technology, physical education, and music and drama. In addition to these classes, students also participate in our Chapel and character education programs. Our art program allows the students to participate in a variety of creative projects using many different mediums. We encourage a love and appreciation of art in all the children. Our Chapel and Character Education programs help students to discover the presence of God in their lives. 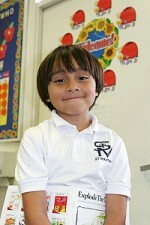 Kindergarten students attend Chapel once per week and Grades 1-5 attend Chapel four times per week. All students, Kindergarten through 5th Grade, have the opportunity to participate in our Community Service program by helping to make Christmas a happy time for the children and families at Hillsides. Other Community Service opportunities may also be offered during the year. St. Martin’s students learn the value of compassion and caring and recognize their own ability to contribute to their communities. Our library is well maintained and our students use the library as a source of information for the various reports and projects they complete throughout the year. Students also learn research skills and are introduced to works of literature. Our music, drama, and performing arts programs are introduced to all students as a means of communication of ideas, feelings and creativity. Students participate as audience members when we invite performers to the school, and as performers in our Christmas Program and/or our Annual Talent Show. Physical education is an integral part of our program that helps build spirit and encourage unity. It also promotes wellness and seeks to encourage a lifetime appreciation of physical fitness. The use of technology is an important skill in today’s world. Kindergarten-5th grade students attend class in the computer lab twice a week to learn computer applications, web research skills, digital citizenship, and computer science concepts.